In December 1945, USAAF Col. C.S. “Bill” Irvine queried Wright Field’s Engineering-Procurement Division with questions on how to modify a standard B-29 into a 10,000 mile range bomber. The focus was upon fuselage structural modifications, increasing fuel capacity, re-rigging for Arctic flight and special instruments for transpolar flights. Appropriate to the Polar Concept being defined in the Pentagon, Colonel Irvine’s modification plan was also approved there. He chose a faster, light weight B-29B (44-8601) one of 311 Bell-Marietta built minus guns and fire control systems, named Pacusan. 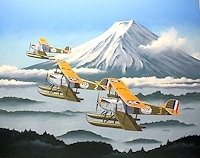 Pete Bower’s first edition of Boeing Aircraft since 1916 displays one photo of Pacusan renamed upon completion of the modifications to Pacusan Dreamboat. 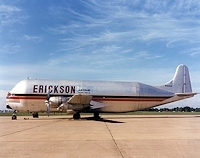 Outwardly noticeable were the reengineered “Andy Gump” engine nacelles with repositioned and modified carburetor air intakes plus threebladed props. (3) Some landing gear strut metal was removed including the anti-icing system and deicer boots, the original B-29 tail and fuselage cone was replaced by a streamline tail cone and vertical fin-rudder from the new Boeing C-97 cargo transport production line. Hydraulic lines were removed and winterized with stronger lines to withstand higher fluid pressures while flying the Polar Regions, plus electrical instruments replacing the vacuum actuated instruments for greater accuracy and special brake linings. (4) Also installed . . .
It’s a real shame that the United States does not seem to honor its history of military aviation with the same enthusiasm as our friends in the United Kingdom. Although the U.S. Air Force, Navy, Marine Corps and Army do maintain dedicated air museums, often (when budgets allow) host air shows, sometimes have dedicated display pilots ready to show off certain types of operational aircraft, and even showcase their aerial capabilities with teams like the Thunderbirds and Blue Angels, none of the services operate vintage warbirds to honor their past accomplishments in defense of the nation. While the Air Force and Navy do sometimes take part in heritage and legacy flight demonstrations involving operational jets flying together with warbirds, the services rely on the cooperation of civilian warbird owners, and do not operate their own vintage aircraft. On the other hand, in the United Kingdom it is hard to go more than a few miles without passing some sort of museum or war memorial. 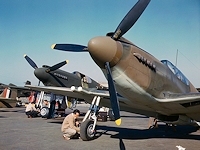 As in the United States, the British military services also have their own dedicated museums, dedicated military display pilots and aerial formation display teams. There is even a separate Imperial War Museum (it would appear that a “war museum” might be politically incorrect in this country) with several different facilities across the island. But, a real difference is the fact that the British military services also maintain and fly historic, vintage warbirds. In the United States, the services only have vintage warbirds as static displays. In particular, the Imperial War Museum (IWM) is dedicated to telling the story of the people who lived, fought and died in the conflicts involving Britain and the Commonwealth since WWI. Its five separate branches, IWM London, IWM North, IWM Duxford, the Churchill War Rooms and the WWII cruiser HMS Belfast attract over two million visitors each year. However, for warbird enthusiasts, IWM Duxford is the crown jewel. Located on Britain’s best preserved WWII airfield, with a history that dates back to WWI, IWM Duxford is considered to be Europe’s premier aviation museum. Integrating state-or-theart exhibition halls with historic buildings, the museum tells the story of the impact of aviation on modern warfare, as well as the stories of the men and women involved. A visit to IWM Duxford generally begins with the state-of-the-art AirSpace building on the east end of the field, progresses through four WWII display hangars, several workshops and other WWII facilities, then goes through the dome-shaped American Air Museum in Britain (reflecting Britain’s appreciation for the contributions made by the United States to the island’s defense over the years) and concludes with the Land Warfare Hall, a modern facility showing the vehicles and weapons used by ground troops in 20th century warfare. But, what really sets IWM Duxford apart from its contemporaries around the world is the relationship between the Imperial War Museum and civilian aviation interests. Though owned by the Imperial War Museum, Duxford is still an operational airfield. Co-located with the Imperial War Museum on the field are: Classic Wings, which offers scenic ride opportunities to the public in vintage aircraft; The Fighter Collection, Stephen Grey’s impressive line-up of flyable warbirds and restoration shop; The Old Flying Machine Co. . . . .
Col. Edward A. Deeds, chief of the Equipment Division of the U.S. Army Signal Corps, came to the conclusion that it was essential for the United States to concentrate its energies upon the smallest possible number of types of engines and to give special attention to equipment that could be manufactured in quantity, and that would be least affected by the rapid advances in the art. He considered it entirely possible to design and build an engine suitable for war purposes and adapted to American ideas of quantity production in less time than the Boiling Commission could complete its investigations and negotiations and send us drawings and models of European types that in all probability would be wholly unsuited to our production methods. He believed that the United States should concentrate its greatest effort on a type of aircraft engine that could be made in powers sufficiently high to assure continued usefulness for a term of years and that would possess the maximum degree of interchangeability between similar parts. Col. Deeds proposed this plan immediately to his associate, Col. S.D. Waldon, who, after giving it careful consideration, agreed entirely with the plan. A few days later J.G. Vincent, of the Packard Motor Car Co., arrived in Washington and proposed substantially the same idea, which had been developed as the result of his experience with aircraft engines, and that had been crystallized by conferences that he had held in Detroit with the French and English commissions that were then touring the United States. As subsequent investigation proceeded this conclusion received the unanimous support of both the American and European authorities and its wisdom has been absolutely demonstrated by the results that have been attained. The line of engines finally decided upon was of 4, 6, 8 and 12 cylinders, respectively, all having a bore of five inches and a stroke of seven inches. The 8-cylinder engine rated at 226 hp was the one believed to anticipate the requirements for power as of the spring of 1918, and the 12-cylinder rated at 330 hp was considered as anticipating the development through 1919 and 1920. Col. Deeds, Col. Waldon, and Messrs. E.J. Hall and J.G. Vincent1 met at Col. Deeds’ apartment in the New Willard Hotel in Washington and considered in a general way the requirements that this American line of engines must meet. It was determined that they should be built around a five-by-seven inch individual steel cylinder with aluminum piston, forked rods, and directdrive propeller, and that nothing experimental or untried should be used. 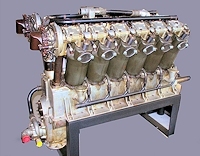 The size five-by-seven inches was adopted because the Curtiss Aeroplane & Motor Corp. and the Hall-Scott Motor Car Co. had experience with engines of this size, and also because Maj. Tulasne, of the French mission, ascertained by cable that the new Lorraine-Dietrich, then the most promising French experimental engine, approximated that size. Messrs. Vincent and Hall set to work on May 29, 1917, to combine their knowledge and information, and within two or three days they had outlined the important characteristics of design of the Liberty engine. These preliminary layouts were submitted to the Aircraft Production Board and the Joint Army and Navy Technical Board, who approved the design and on June 4 authorized the construction of five each of the 8- and 12-cylinder sizes. Detail and manufacturing drawings were begun immediately; this work was done partly by the staff of the Packard Motor Car Co., under Mr. O.E. Hunt, and partly by an organization recruited from various automobile factories and working at the Bureau of Standards under Mr. Vincent. Parts . . .
Fred Weick, one of general aviation’s great engineers– born in Chicago about the time the Wright Brothers first flew – grew enamored of planes, watching pioneer aviators like Matty Laird and the Stinsons at Cicero Field. He started his aeronautical career building large, flying model airplanes as a boy, and even built his own car from scratch. The lanky teen worked his way through college by helping modify WWI surplus deHavilland DH-4 biplane bombers into air mail transports, for the Post Office. He also helped scout and plan the first transcontinental air mail route. “Propeller-Head” Engineer While working briefly for Chicago’s Yackey Aircraft (where he learned to fly), Weick finished engineering school, distinguishing himself as an aeronautics whiz – particularly in propeller design. The Navy, in Washington, D.C., hired him as a propeller engineer. Weick quickly developed a way to cut propeller design from weeks to less than a day. Next door to his Navy office was the office of the National Advisory Commission on Aeronautics (NACA, forerunner to today’s NASA, but only for aircraft research). NACA Chief Engineer, George Lewis, hired Weick away as a propeller expert, and Weick developed NACA’s Propeller Research [wind] Tunnel (PRT). At the PRT, Weick developed one of the most important advances in 1920s aviation: the NACA cowling. Air-cooled radial engines, most reliable, efficient, high-powered airplane engines at the time, were hobbled by the incredible drag from their cylinders, each jutting individually into the propeller slipstream. Weick enclosed them with a cowling designed so that enough air entered to cool the cylinders, but the fastest propwash was smoothly deflected around the engine. The resulting “NACA cowling” revolutionized airplane performance. The Travel Air Model R Mystery Ship introduced the NACA cowling at the 1929 National Air Races, becoming, at 200 mph, the first civilian plane to outrun the military’s best fighters. America’s highest honor for advancing aviation, the Collier Trophy, was awarded to NACA that year for Weick’s discovery . . .
Pioneer aviators often faced challenges, trials, and tribulations as they worked to make the dream of human flight a reality. One of these aviation pioneers, whose name and contributions are often overlooked, was Hugh Armstrong Robinson. An inventor, engineer and pilot, Robinson survived several test flights, air show stunts and spectacular crashes to further his dream of flying. In the process, he set many aviation records, had many “firsts” in the field of general aviation and made several contributions to military aviation. He lived doing what he loved. Robinson started with building and repairing bicycles, but he soon progressed to motorcycles. In fact, he created the first motorcycle Neosho residents had ever seen. (2) Although his early efforts often met with disaster, Robinson would faithfully repair and restore his bikes to allow him to engage in additional outstanding feats. Once he attempted to ride down a long flight of wooden steps in a Neosho park. “For the first 30 steps the performance was perfect, but Hugh overlooked the fact that the steps were broken by a landing. When he reached the landing he and the motorcycle abruptly severed connections. He shot straight into the air for 20 feet and then dropped like a plummet for 20 feet more.”(2) It took two doctors two days to remove all the gravel from his body! In 1904, Robinson moved to St. Louis to take a job as a foreman for the Dorris Automobile Co., and in this city, he had the opportunity to interact with some of the best balloon pilots in the world at the St. Louis World’s Fair.1 His burgeoning interest in flight grew to a passion and progressed from ballooning and gliders to powered airplanes. 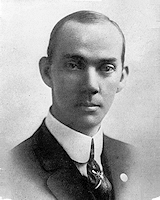 In 1909, he met Glenn Curtiss at the St. Louis Centennial . . . The first manned Gemini flight and first U.S. space flight with two astronauts aboard featured the test of a fully maneuverable capsule. The Gemini 3 (Gemini-Titan, GT-3) was unofficially dubbed “Molly Brown” (from the movie Unsinkable Molly Brown). Command Pilot, Astronaut Virgil I. “Gus” Grissom’s first spaceship, Mercury 4 (Mercury-Redstone, MR-4), named Liberty Bell Seven, sank and was lost after his first space mission during after-landing recovery attempts. Grissom chose “Molly Brown” as a witty reference over NASA’s reluctance for this capsule’s call sign. During the flight, Grissom altered Gemini 3 spacecraft’s orbit to a more circular pattern, using on-board thrusters, practicing techniques, which would be applied during upcoming Gemini rendezvous and docking missions. (Lethbridge) This time the U.S. Coast Guard was there nearby at splashdown to recover both astronauts and prevent the second capsule from sinking beneath Grissom. Not all went as intended. NASA mission planning assigned two backup Coast Guard recovery forces, each consisting of a small ship bearing a helicopter, located miles up-range from GT-3’s intended splashdown location. The prime recovery units, Navy aircraft carrier, USS Intrepid, with two Navy Sikorsky SH-3A Sea Kings, along with two Navy destroyers, were within a 10-mile ring calculated as the spacecraft’s water landing spot. Furthermore, Intrepid carried NASA personnel to handle the spaceship’s post-flight recovery and examinations plus multitudes of news reporters to witness this “first” pilot-controlled spaceship’s return from earth orbit. The two large Navy helicopters were aboard Intrepid to pluck astronauts from the sea at the expected close by landing site. The carrier would hoist the capsule aboard with a crane for NASA. The Air Force had a C-54 flying overhead in the recovery area carrying two para-rescue swimmers to assist the astronauts in escaping from the capsule and aid them, in their clumsy space suits, into rafts. These swimmers, once parachuting to the capsule, were also to install a floatation collar buoying the capsule, preventing it from sinking, while waiting for Intrepid to arrive and pluck it from the sea. The Air Force backup flight could respond by flying quickly to any nearby location should the spaceship land outside the planned landing zone. 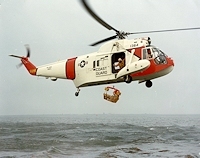 Coast Guard engagement, as a part of the recovery team, came 14 days before splashdown. A helicopter detachment was quickly assembled at Aircraft Repair and Support Center (AR&SC), Elizabeth City, N.C., with pilots, crewmen and helicopters “from five widely scattered air stations, many who did not known each other…and yet from the beginning . . .
Joseph Malek Shimmon, the author’s uncle by marriage, was born in Urmieh, Western Azerbaijan, Persia, on July 4, 1894. His father died shortly after his birth, leaving his mother to raise him. In 1907, at age 13, he left Persia and his mother to immigrate to the United States. Making his way across Russia and Germany, he boarded a ship to America in Bremen, arriving in New York City in November. There, he was met by his uncle, Paul Shimmon, who lived at 503 West 124th Street, New York City. Uncle Paul enrolled his nephew in the Hoosick Falls Prep School, some 155 air miles north of New York City. There, Joe Shimmon finished school through his 12th year, going on to Columbia College of Columbia University. He completed a degree in banking and worked for a time for First City Bank of New York. While at Columbia, he was a member of the Theta Chapter of Phi Sigma Kappa fraternity. A 1923 history of the fraternity listed him as well as dozens of other members who had served in the military. Shimmon registered for the WWI draft on June 5, 1917. At that time, he was employed by the American Agricultural Chemical Co., of Carteret, New Jersey. The company made sulfuric acid, fertilizer and other chemicals. He was in charge of several men with the company and was earning $1,100 per year. His military service began with enlistment on September 24, 1917, and assignment to the Seventh Company of the 153rd Depot Brigade at Camp Dix, New Jersey. He wanted to fly but was told that he could not get a commission because he was not a U.S. citizen. At that point, Joe Shimmon told the Air Service that he would go to Canada and join the Canadian Air Force. The Air Service reconsidered and told him that he could go to flying school and would get his citizenship. His naturalization certificate from the United States District Court of Memphis, Tenn., showed that he became a U.S. citizen on June 15, 1918. He completed basic training on November 16, 1917, and began aviation cadet training, which he completed and was commissioned as a second lieutenant on June 20, 1918, five days after becoming a citizen. By October 4, 1918, the military training record showed that Joseph Shimmon had one year of experience as an airplane mechanic and nine months as a military aviator, beginning in February 1918. According to family history, flight school was at Fort Dix, New Jersey. Once that was complete, he and a mechanic set out on a long cross-country flight to Fort Sill, Oklahoma. The trip was an aviation adventure typical of the days only 15 years after the Wright brothers’ first flight. Following the “iron compass” of railroad tracks, the airplane wended its way into Iowa before heading south. At Council Bluffs . . .
On September 28, 1924, three single-engine biplanes landed at Seattle, Wash., two having left there nearly six months earlier, flown across the Pacific — and around the world — for the first time in history. A scant 27 years after Columbus discovered the New World the first global voyage got under way. Ferdinand Magellan sailed from Spain with five ships and 237 men, searching for new western trade routes. After untold hardships and the loss of four ships, the Victoria with Capt. Sebastian del Cano in command, and 18 surviving crewmen from the original party, returned to Spain on November 6, 1522, becoming the first in history to sail around the world. Magellan did not live to enjoy recognition for this great accomplishment, having died in the Philippines the year before. It was said that the spices carried by the Victoria on its return was enough to pay for the entire voyage. Four centuries were to pass before the next globe-girdling record was made — the circumnavigation of the world by air. Less than 21 years after the first successful controlled flight, a group of intrepid U.S. Army Air Service pilots accomplished the feat. Flying husky, open cockpit biplanes, and enduring incredible hardships, they returned in triumph to Seattle, Wash., and to the pages of history. World War I, which saw the airplane develop from an expensive toy to a formidable fighting machine, ended in November 1918. In the following years the continued development of the airplane became a worldwide obsession. Former military pilots and farm kids — anyone with a little cash could and did buy surplus Jennies, etc., for a few dollars — and aviation really took off. Barnstorming and air shows brought aviation to rural and small-town America; and $5 rides fired the enthusiasm of young America. Speed, distance and altitude records were made and broken almost weekly. Aviation was definitely here to stay, but for growth, it needed credibility and purpose. 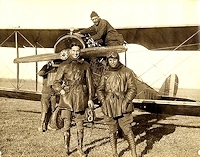 In the years following WWI, the U.S. Army Air Service suffered greatly from the lack of funds. Being the “new kid on the block” in the Army organization they were at odds with tradition. The Army was, historically, foot soldiers, tanks and . . . The recent intense discussions of whether Gustave Whitehead flew before the Wright Brothers (or at all) require that I comment, as I have a unique personal perspective on this issue. Despite the statements by the Editor of Janes’ All the World’s Aircraft, and the recent bill passed by the Connecticut Legislature, the fact is, Whitehead didn’t fly before the Wright Brothers and probably did not achieve powered flight as he claimed AT ALL. I am now 75. After some research, it appears that I am the last living member of the Board of Directors of the Connecticut Aeronautical Historical Association (CAHA) that considered the Investigative Committee’s report on the claims of Gustave Whitehead. I am the final witness to that Board of Directors (BOD) meeting and its discussions. That meeting, and those discussions, have been sealed for several decades because of the insistence of the Whitehead supporters who knew that release of them would seriously damage their claims. At the time of the incidents with O’Dwyer at the CAHA BOD Meetings (discussed in detail below), I was in my twenties. All other BOD members were in their forties to sixties. With my exception, this would make these board members 90 or older. All of the principal persons in the incidents discussed below are dead to my certain knowledge, and while it may be possible that one or two of the others might still be living, I have not tried to verify this for every case. 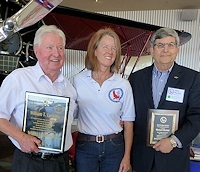 CAHA is the parent organization to the New England Air Museum (NEAM). CAHA’s policy (and NEAM’s policy) for about 45 years has been to remain neutral in all debates concerning the Whitehead claims. I know – I was one of the BOD members who voted for that policy to avoid expensive and pointless litigation with William O’Dwyer, Stella Randolph, and their supporters. I believe the current NEAM management will not be pleased that I am publicly breaking with that policy because they want to avoid the controversy. However, given my age, I feel I have a moral responsibility to explain several facts. Last year two unfortunate events occurred that involved the Whitehead claims and contribute to my decision to no longer remain silent. 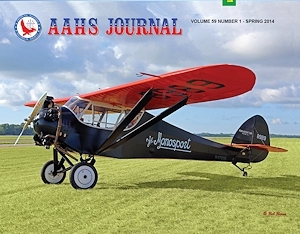 The editor of Janes’ All the World’s Aircraft (“JAWA”) published an editorial that endorsed the Whitehead claims and wished to replace the Wright Brothers with Whitehead in the view of history. The Connecticut Legislature passed a law (HB 6771) removing the Wright Brothers as the pioneers to be remembered on the State’s “Powered Flight Day” and replaced them with Whitehead. Both are in serious error. To be blunt, Whitehead’s claims are all fictitious – he didn’t fly. . . . .